East Animas (East A) is located just outside town and is the local trad climbing hangout. There are many fine bolted climbs, but many of these require some gear. The rock is Sandstone of varying quality. The routes are one or two pitches in length and range in difficulty from 5.6 to 5.13. There are several area classics on the Watch Crystal, which is one of the best pieces of stone in the Durango area. There are many other scattered gems, plenty of adventure, some loose rock, good old-fashion sandbags, and overall good fun to be had! East A is west facing and the cliff is shady in the morning and sunny in the afternoon. Typically the best seasons are spring and fall. Summer mornings and winter afternoons can also be pleasant. The area is located on the east side of the Animas Valley. You can see the rock when driving north out of town. Take County Road 250 north from Durango for almost a couple of miles, and locate a dirt parking lot on the east side of the road. It is just past an old barn. There is a sign for East Animas Climbing in the parking lot. The approach trail leads to the base of the Watch Crystal. The surrounding land is private, so respect the locals that live in the area. PLEASE PICK UP YOUR BUTTS AND BEER CANS. The parking area has seen some abuse and none of us want that kind of attention being drawn to the area or the local climbing community. 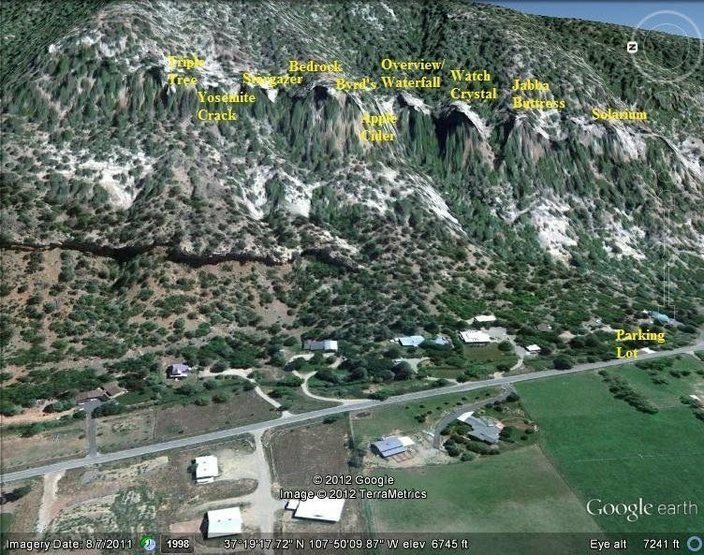 Google Earth of the East Animas crags. The approach trail leads to the Watch Crystal. Top of Kong route on the Watch Crystal. Watch Crystal Face @ East Animas. Another beautiful night for a de-proach. Anyone interested in East A ethical issues should check out the route Contortionist on this site. A lively debate about convenience and quality vs. traditional ideals. That's some clever phrasing, pairing "convenience and quality" as being the other side of the argument against "traditional ideals". "Quality" is applicable to either side of the argument, depending on one's perspective. I agree that a bolt would make the Contortionist more popular as a lead but does ever climb need to be brought down to the level of the average climber? Should we add bolts to the Bachar-Yerian to make it more accessible to the general climbing community? Its with in the same grade range and within the same general headspace as the Contortionist. Granted it is not as classic as the Bachar- Yerian but that does not mean that it dose not deserve the same respect! Brad, I agree. Ideals = quality. My own ideals straddle both sides, so I'm enjoying the debate in my own mind as well. As Skyeler said, I suffer from "cognitive dissonance". Ian, I don't think a bolt would bring the "level" down but only the time spent getting the gear. Just like placing fixed anchors at the top of a route make it more convenient, but not more accessible. Anyone can stand there for twenty minutes and fish in stoppers, then it's all about the (still really hard) move(s). There is no runout factor. A route like the Bachar-Yerian has no "hassle factor", just the big runouts and route finding. The addition of bolts would indeed bring the "level" of climbing down on that route. It is an entirely different world. In other words, there is no "headspace" to get into on Contortionist, only the hassle of getting the gear, then you're safe. I agree though that any fixed gear would change the nature of the route significantly. I also understand that getting the gear is part of the quality for some people, just as the runouts on Bachar-Yerian are an element of quality on that route. More anchors STOLEN from the top of Apple Cider! Ben, Matt, and I aded some lowering hooks to the anchors of AC and they were now taken. To whomever is stealing anchors: If you have a problem with lowering biners or whatever on the top of routes, have the sack to tell me or others that have graciously added this gear. If you are just poor and have to steal to fill you personal gear, please call me and I will buy you new biners so you don't have to steal from other people and the climbing community. I am serious... I will buy you brand new biners! I second Bill's comment. Be mature enough to leave them alone, especially when they are replaced after you probably stole the first set. If you need the biners for your rack, we will get you nice new wire gates! It is very annoying to think they are there, and then get to the anchor and they are gone. The fixed line is there for a reason. It is there as a service to the climbing community to access the upper area of the Watch Crystal Crag and for emergency purposes. It is maintained by La Plata County Search and Rescue and is replaced multiple times a year. Being able to ascend this fixed line during a emergency is critical for rescue personnel to be able to setup the rope system to evacuate a injured person. Unfortunately your timing on taking the fixed line down happened to coincide with a climber getting seriously hurt. Being able to ascend this line would have saved valuable time in get the appropriate care the patient. Please do not remove the fixed line. Hey Durango, I lost a #2 Camalot with a yellow CAMP Nano 22 somewhere at East A. last weekend. I may have left it at the base of Apple Cider in the dark or it may have fallen out of my backpack when it came unzipped on the way down the trail. It wasn't at the base of Apple Cider today, so I think it may have fallen out of my pack. It can identified by blue nail polish on the bottom of the axle in between the lobes.